Mark your calendars ladies! 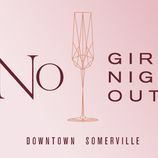 Girls Night Out is back! Join us in Downtown Somerville on Thursday, May 16, 2019 from 5-9 pm for a night on (and around) the town in honor of you! You will not want to miss this years celebration, there will be so much to do and experience - grab your friend's and make it a night to remember.